The search is continuing for 46 South Korean sailors missing after their ship sank near the disputed maritime border with North Korea. The naval patrol vessel sank after an unexplained explosion ripped through its hull, reports say. Fifty-eight sailors have been rescued, a military official told AFP news agency. A military spokesman said there was no indication so far that North Korea had been involved in the incident. The boat sank off the west coast of the divided peninsula, in an area which has seen deadly exchanges of fire between the navies of the North and South in the past. A spokesman for South Korea's Joint Chiefs of Staff said navy divers were preparing to investigate the cause of the sinking and possibly retrieve bodies. The 1,200-tonne Cheonan had been on a routine patrol near South Korea's Baeknyeong Island at 2130 local time (1230 GMT) on Friday when it began sinking, Rear Admiral Lee Ki-sik told reporters. Military officials told South Korea's Yonhap news agency that an explosion tore a hole in the rear hull, shutting off the engine and quickly taking the ship down. A number of the crew jumped into the water, Yonhap said. Six naval ships and two coastguard vessels, as well as helicopters, rushed to save the crew, Yonhap and military officials said. There was no sign of the North's military in the area where the ship sank, Yonhap said, citing officials. South Korean President Lee Myung-bak convened an emergency meeting of security officials and said all possible causes for the sinking would be investigated. He ordered the military to focus on rescuing the sailors. 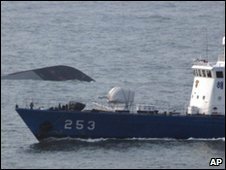 There were reports that another South Korean ship had fired shots toward an unidentified vessel, but officials later speculated the target had been a flock of birds. The incident comes at a time of tension between the two Koreas. International talks aimed at ending the communist North's nuclear ambitions have been stalled for months. North and South Korea are still in a official state of war because the 1950-53 Korean War ended only in a truce. Since then, they have fought three bloody skirmishes in the Yellow Sea. In January, North Korea fired about 30 artillery shells not far from Baeknyeong. South Korea fired 100 warning shots in response, but no injuries were reported. South Korea recognises the Northern Limit Line, drawn unilaterally by the US-led United Nations Command to demarcate the sea border at the end of the Korean War. The line has never been accepted by North Korea.